Members of the Fingal Bay Probus Club enjoying themselves on their trip to Nundle. Photo by Lynn Moffitt. IN many ways the Fingal Bay Probus Club members are getting more out of life, and one way they are doing this is to travel together. 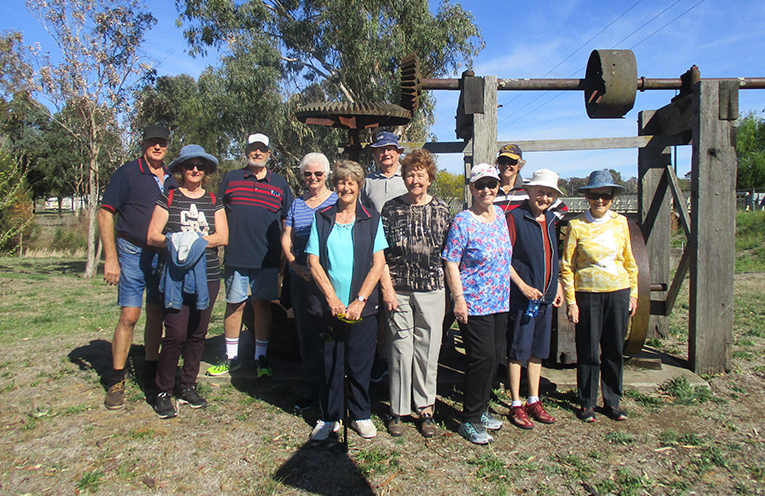 Sixteen members of the Probus Club recently went on a five-day trip to explore the fascinating old gold-mining town of Nundle. While some of the Probus Club members took their caravans, other members stayed in comfortable cabins for the trip at the Fossickers Tourist Park. The historical cemetery at Hanging Rock and the nearby trout farm were also inspected, and a whole day was spent in Tamworth, where the group took lunch at the pub next to the Golden Guitar Museum. The trip included barbecues inspired by a bonfire area and a wine tasting on the last night which was a great farewell to an enjoyable break of fun and friendship.